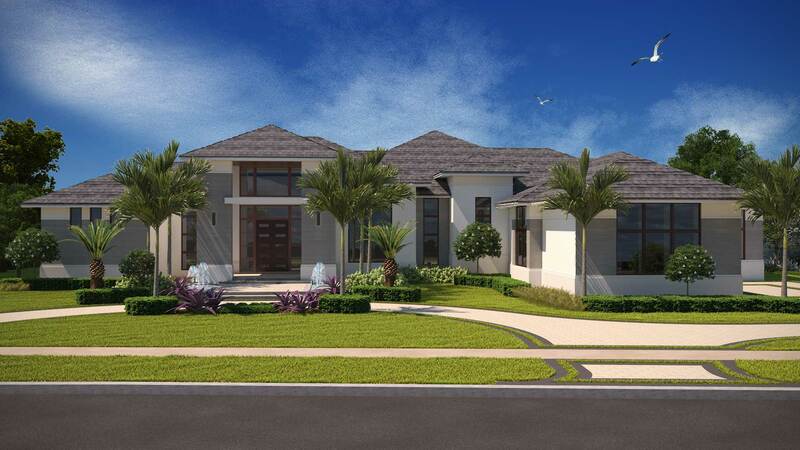 Diamond Custom Homes has announced the construction of Laurène, the 8,485 total square foot model home in Quail West at 13961 Williston Way. The warm contemporary model Laurène is designed by architect Rich Guzman of RG Designs, with interior design by Rick Foreman of Pacifica Interior Design, and landscape architecture by Pat Trefz of Outside Productions Inc. The model estate will have four bedrooms, four bathrooms, two half bathrooms and a four car garage. Key features of Laurène include the flex clubroom, formal dining room with glass wine cellar, and beautiful lake and golf front views. 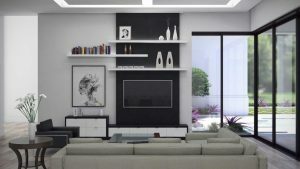 The overall interior color palette is black, white, and grey. Foreman has chosen to implement hardwood floors throughout the modern home, giving the interior a comfortable and warm feel. The cooler palette used throughout the home will be perfectly complemented by the warm wood flooring. Leading up to the glass double door entry is a pathway with water features welcoming you on either side. The luxurious entryway opens directly into the foyer with views to the outdoor space. The outside of this contemporary model is unique to the Quail West community, with Neolith cladding used on the exterior. Laurène boasts incredible ceiling designs, delicate trim work, and expansive glass windows allowing sunlight to shine through the estate, giving the space even more open ambiance. “This home is designed to be extremely livable and approachable, and offers the homeowners the best of both worlds – private, yet perfect for entertaining; contemporary, yet warm. 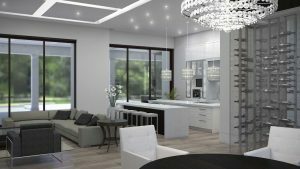 This model will be move-in ready by the winter season in Naples, and we know it will appeal to many,” says Michael Diamond, President of Diamond Custom Homes. The clubroom features a full bar and a Full Swing golf simulator. This flex game room will serve as an optimal entertaining space with ample seating and screen projector. Other unique features of this room include a fireplace and unique ceiling design. The formal dining room includes a three-sided glass wine room as a spectacular centerpiece. The model will have an extremely easy to use gourmet kitchen that flows masterfully. Complete with two islands and a breakfast nook, the kitchen will be ideal for entertaining with its abundant countertop space. 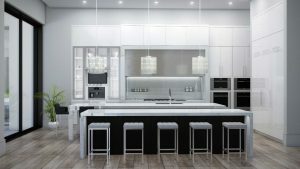 Cabinets will have a unique lacquer finish and the cooktop wall is designed to be both aesthetic and practical. Laurène prioritizes privacy with the entire left wing of the house dedicated to the vast master suite, while the right wing hosts two bedrooms and VIP guest suite. The master suite will have a private sitting area with unobstructed views of the lake and golf course beyond. The luxurious master bathroom is designed with his and hers closets and sinks, a dual entry shower, and a freestanding bathtub to maximize relaxation. Laurène is scheduled to be completed by January 2019 and will be sold furnished.